In the previous article we developed the basic lines of the Explorer concept: a yacht shaped around the owner and suitable for long voyages and ocean crossings, for living in close contact with the sea and all its manifestations. One thing in particular fascinated us during the brainstorming: the relationship with the sea and the design related responses arising from this guide-concept. So we decided to take another step forward, going deeper into this aspect in relation to an area of the vessel traditionally dedicated to contact with the water: the stern. The chosen approach to the theme derives from the very nature of the object Explorer: being an itinerant architecture it doesn't belong to a "place", isn't related to a specific geographical environment and so it eludes a logical characterisation linked to context. 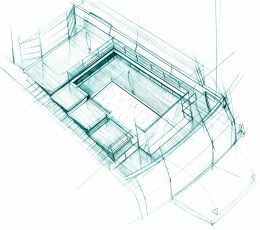 Contrarily, design related efforts run in the opposite direction: to offer an object which can be a "place" in itself, anywhere, transforming and adapting from time to time to different climatic, geographical and environmental conditions. In other words, we tried to imagine form and function not by crystallising them into a particular solution but by means of a selection of possible situations such as to supply a "chameleonic" design response. The area of the stern is considered, from both the owner's and designer's viewpoint, as a very important theme within overall ship design. The reasons for this may be technical, architectonic or "merely" aesthetic. It is a zone of the vessel subject to different uses. So we find open air sterns, fully furnished to supply a terrace overlooking the sea; sterns that slope gently towards the water, inviting guests to enjoy direct contact with the sea; sterns that house tenders and toys to make the sea an occasion for relaxation and fun, and majestic, imposing sterns that tend to close off all perception from interior to exterior and vice versa. Each of these solutions is optimised for certain conditions: at sea or in port, with Mediterranean climates or cold North Atlantic temperatures, to live in company with guests or to admire the sea in seclusion. The Explorer typology, however, has extremely variable requirements due to its extreme versatility and the different conditions it will meet under way. The limit of the stern area is given forward by the block of vertical connections situated at two thirds of the ship's length, an actual joint that passes through all the decks, constituting the backbone of the boat's connective tissue. It is not at random that the "filter" overlooks the stern environment: the latter is in fact the actual shared area of the boat. Crossing the connective vertical you not only move from one space to another but, first and foremost, you change your way of experiencing the boat, you leave the "private" and intimate aspect of the cabin and enter the collective dimension of shipboard life (amusement, relaxation, games, sports etc.). This functional variety leads us to approach the stern volume, subdividing it in such a way as to offer a wide range of solutions, to give a sensation of vitality and to satisfy the most varied recreational needs. This aspect reflects on the "form" the object takes on: the fullness of the forward zones gives way to an "emptiness" into which surfaces and volumes are projected for the different functions. The fulcrum of the space under study is certainly the pool to which all the stern area activities and functions gravitate. It's an actual internal basin that can be filled with water. 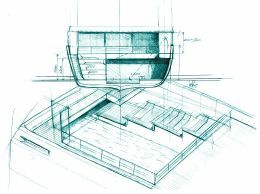 By means of a system of mobile hatches and sliding skylights a multiplicity of scenarios can be configured: from indoor pool to unique artificial beach, from air conditioned solarium to garage for tenders, with adjacent launching and recovery gear. The pool water is at sea level. For reasons of stability the pool (about 8 x 4 metres) lies along the fore-and-aft line, occupying the area between the transom and the engine room bulkhead. The decks overlooking the pool - deck "0" and the main deck - are "folded" in the stern area to approach the waterline in a pleasing play of platforms and steps: an actual way down to the sea (as on terra firma to access bays and creeks) which, generating a gradually changing perspective, always gives us a dynamic perception of the designed and the natural space. 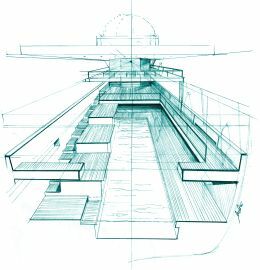 A fundamental contribution to this flexibility and changeableness is made by components designed to ensure that the pool interacts with the surrounding environment and climate: the macro-systems of opening aft, at the sides and to the sky. The stern hatch is subdivided into three partitions: the central area, which abuts on the main deck, is hinged below the waterline in such a way that when opened it puts the stern pool in communication with the open sea and reveals the Explorer's well equipped "belly" to the light and the sea breeze. 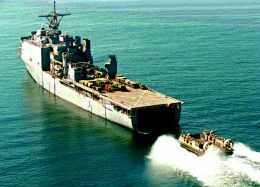 It's a solution borrowed from Navy vessels that transport fast landing craft and that generally have an internal basin that can be water-filled. The structure of the central hatch is completely watertight, with a buoyancy that partially counterbalances the loss of thrust due to the flooding of the stern zone. To keep the Explorer in trim there are, moreover, ballast tanks forward that rebalance thrust. 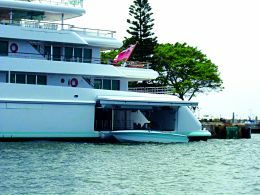 When the stern hatch is open, at the entry to the pool there is sufficient threshold for coming in with jet-skis and hydrojet tenders, leaving guests free to enjoy the toys housed in the pool space or to leave the vessel for short trips in the places visited by the Explorer. The two side partitions, on the other hand, are classic hatches that form a projection towards the sea, in continuity with the lower deck, constituting the final offshoot of the vessel and therefore the natural result of descent into the water. At the sides, wide glazed areas help to "break through" the space, ensuring a pleasurable visual effect both under way and at anchor. With view to allowing all year round use in any climate, an electronically controlled covering system was devised, inspired by the so-called magrodome systems used on the latest cruise ships. A trellis structure in aluminium runs, divided into approximately 2.5 metre long partitions, on two tracks from the entrance to the dining room/saloon area to the stern area. When the magrodome is fully closed the after part of the main deck is completely open. When the magrodome is closed in abutment with the glazed area aft, the transparent covering creates a unique environment, bright and sheltered. Such a versatile environment of course requires apparatus and systems which, in the most diverse conditions, can generate a microclimate that is always calibrated and comfortable enough to satisfy those guidelines of well-being and comfort that we have taken as prime factors in the Explorer design concept. With the hatch open the pool water is at sea temperature, whereas when it is closed the water can be heated directly by the engine cooling system. The low beach can be heated with fancoils when the external temperature drops excessively, thus ensuring - together with heated water - an optimal level of comfort. The high area, an overhanging solarium, can be freshened up with atomised water when the magrodome covering is removed. In cold climates the transparent covering guarantees a greenhouse effect sufficient to ensure pleasurable warmth inside. Definition of the stern area, featuring terracing and views, nonetheless leaves space for mooring manoeuvres. By way of a handy passage on the starboard side (with the possibility of having another on the port side) you reach the transom with its two spacious symmetrical areas, a total break with the hypothesised asymmetry of the terraced spaces, for the various mooring manoeuvres. The special nature of the design and its innovative way of conceiving the vessel space - meaning a space no longer univocally connoted nor blocked by a layout of volumes and furnishings that limit its exploitation - led us in this embryonic design phase to hypothesise pure and linear geometries, easily changeable and flexible with regard to different requirements of a structural and architectonic type. Clearly, treatment of the theme can neither be considered concluded nor, for that matter, studied to the depth called for by a "real" design project. Our desire remains that of setting out a mental itinerary which, as a whole, lays down the guidelines for a global marine architecture project.